Written by a spiritual master this is an important Lent title that examines what it means to celebrate the Eucharist, and in turn reminds us of our capability for love, hope and faith.The Eucharist writes Timothy Radcliffe is a three part drama, forming us in faith, hope and love. 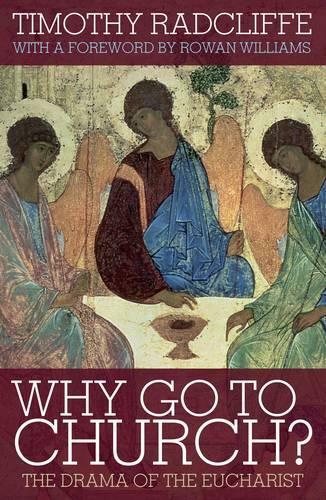 In this book he examines what it means to celebrate the Eucharist. Whilst other people experience it as boring and pointless, listening to the readings, the homily and the creed all take us through the crises and challenges of faith. From the offertory through to the end of the Eucharistic prayer we are caught up in the hope that was Christ's, faced with Good Friday. From the Our Father until we are sent on our way, especially in receiving communion, we are formed as people who are capable of love. Book launch mentioned in The Observer. Title mention in Christian Marketplace. "Radcliffe packs each paragraph with so much information that you have to read the book slowly to take everything in. But this is not a complex tome, nor is it a trivial self-help book on personal spirituality. Radcliffe uses popular culture and spiritual writings to try to reconnect us with God through the Eucharist and through the community of believers. This is why we go to church." US Catholic--Sanford Lakoff "Us Catholic "
"It is accessible, fresh in approachand thought provoking. Offering a refreshingly new way of comprehending the structure, flow and inner dynamism of the Eucharistic Liturgy, this book is a must for those who would incline to propose a Christian Spirituality which is devoid of any communal aspect. It is also essential reading for those who struggle to understand the relevance or necessity of common prayer, liturgy and ritual. It will prove inspirational for those who seek to deepen their understanding of the Eucharistic Celebration" The Furrow, Journal for the contemporary church, June 2009--Sanford Lakoff "Face The Nation "
"Why go to Church? has become something of a publishing phenomenon in the past few months.. Timothy Radcliffewas described as 'the Archbishop of Canter-bury's favourite theologian' ...an Ulster orangemen was overhad saying that it was one of the best talks he had ever heard" this is a fine book, especially to be recommended to the intelligent avarage reader" Vol 5 Issue 3--Sanford Lakoff "Pastoral Review "
"In the face of our 'spiritual but not religious' and institution-wary culture, Timothy Radcliffe, the English Dominican, explains why going to church is so much more than participating in an archaic tradition. In this book, Radcliffe explores how the Eucharist recreates the drama of human existence, which unfolds slowly throughout our life....he is careful to separate our faith from our society's emphasis on individualism and consumerism...Radcliffe uses popular culture and spiritual writings to try to reconnect us with our core, our intimate relationship with God through the Eucharist and through the community of believers. This is why we go to church." - U.S. Catholic--Sanford Lakoff "Us Catholic "
"Radcliffe writes as a believer, for believers....Why Go to Church? Is a mix of Eucharistic theology, commentary and spiritual reflection stimulated by the various parts of the Mass. Overall, it is more than an extended meditation than a theological treatise. It shows the subtle art of a seasoned preacher who knows how to invite his audience into the happenings of grace by telling a story, reciting a poem, relating an experience or making a point with humor or a well-chosen quote...Radcliffe's meditation on the Eucharist can be inspiring reading for preachers and teachers." - America: The National Catholic Weekly--Sanford Lakoff "America: The National Catholic Weekly "
"The engagingly expressed thesis of the book is that the Eucharist is a drama in three acts, linked to faith, hope and charity (love)..."[Going to church] is not merely a big subject, it is the central point of Christianity..." Christopher Howse, The Daily Telegraph--Sanford Lakoff "The Daily Telegraph "
"Why Go To Church should be required reading for anyone who has ever felt the urge not to attend a Sunday Eucharist or who has ever confessed inattentiveness, ambivalence, or boredom with the Mass. This insightful and pastorally sound book will reintroduce the reader to the fundamental value and joy of actively participating in the daily or weekly gathering of God's people.... This helpful commentary, filled with touching stories and real life occurrences, will certainly bring new insights and renewed enthusiasm for our most traditional form of prayer.... This title is recommended for parish libraries and personal reflection." John-Leonard Berg, Catholic Library World--Sanford Lakoff "Catholic Library World "